compromised film 'The Shack' - Why? Since the the book's release in 2007, it has sold over 20 million copies (link), and largely endorsed with relatively little opposition in Christian circles, even globally. 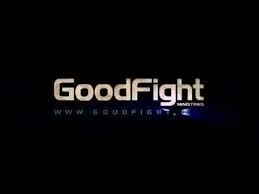 To date, the film has grossed over $57 million (link). Its popularity among mainstream Christianity as well those outside of it - despite the controversy that surrounds it - is intriguing. Even with the story's rather careless, theological interpretation of the gospel, the Christian music artists who read the novel agreed to work on the film's soundtrack. They are either not discerning or understanding the heretical errors, or are completely on board with its doctrinal position. Either way, when given the opportunity to set the scene of the book-turned-film emotionally through their music, at least some of these big name artists eagerly jumped on board. Hillsong United, arguably the most recognized group in Christian music, clearly supports the film and its story line. Worship leader and writer Joel Houston gives an insight on their take: “The reason I believe the people need to see this film, why ‘The Shack’ is perfect for right now,” he says, “is because people are searching for something real – and something true...if there’s one film you see this year, you need to see ‘The Shack’” (link). Consequently, Hillsong, whose Heaven Knows is debuted in the soundtrack, is probably the biggest name attached to the film's soundtrack. Though the group continues to successfully pump out music, what goes on behind the scenes warrants further inspection. In 2015, a controversy over Hillsong's worship leaders Josh Canfield and Reed Kelly, who came out as being gay, brought about turmoil. Claims that the two received a stamp of approval following the accusation were later disputed by Hillsong founder Brian Houston (link). 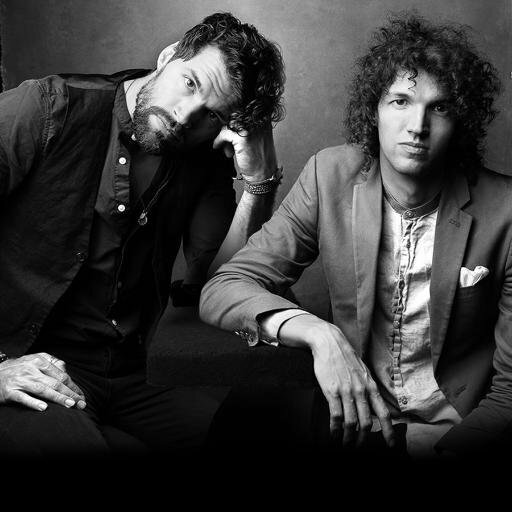 Joel and Luke Smallbone, two brothers from Nashville, Tennessee, who form the group for King & Country, also made the cut with their song Amazing Grace, which helped give momentum to the film's success. Both men were equally impressed with the film. Said Joel: "Don't put faith in a box", he said candidly, and with a deep theological undertone. "Don't put Jesus Christ in a box..expand[ing] your mind in that way is a beautiful thing” (link). What other conclusion would we come to then, that the “expansion of mind”, mentioned by Mr. Smallbone, would also affirm the doctrine of Universalism (a doctrine that says every human soul - because of divine love and mercy - will ultimately be reconciled to God, which is pushed in the book? This theology might be what professing Christian Kelly Clarkson seems to be leaning towards as well, adding her talents with the song Love Goes On. She doesn't limit its message as appealing only to Christianity. “The spiritual aspect [of the film] can touch anyone...It doesn't matter what walk of faith you are. It doesn't matter what your belief is.” (link), she said. The Shack soundtrack also includes the wildly successful, Hip-Hop artist Lecrae. He collaborates frequently with top Christian and secular artists, and is considered by some the biggest name in Christian Hip-Hop (link). Lecrae, who considers the movie as being “phenomenal” (link), partnered with worldly-immersed Breyen Isaac, - another big name in that world, but, solely on the secular side (until now). According to Lecrae ('Bre-On', as he calls him), is “a phenomenal writer, producer, singer” (link). The product of their collaboration resulted in the song River of Jordan. 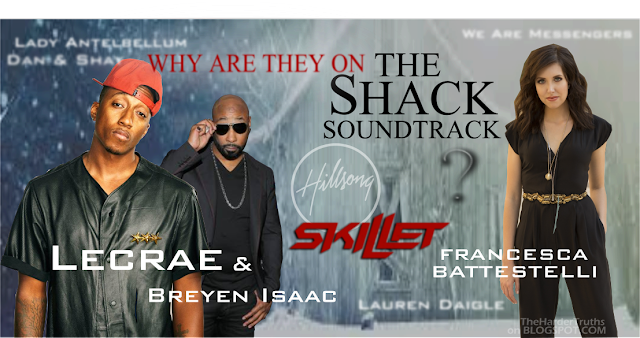 But why Lecrae chose Breyen Isaac to produce a song for a supposedly Christian film is a brow-raiser, since his latest work was also included on the soundtrack of Fifty Shades Darker - a film which can't get much further away from Christianity. When asked about his thoughts on The Shack , Isaac heretically (and perhaps unknowingly) made the false claim: "...God is bigger than religion and God is bigger than doctrines..." (link). This is an interesting take since the entire faith of Christianity is based on doctrine. Like Isaac, Lecrae seems to have the same mindset about The Shack: “Regardless of what you believe or where you come from I think the film is very relate-able to everybody.”, he clarifies. “Me as a person, I have my own beliefs, just like everybody...the music is transcendent.” (link). This 'transcendence' view he holds may be very well be a factor in his performing with Ty Dolla $ign in the song Blessings (2017). Ty Dolla $ign has his own music littered with sexual violence, immorality and indecency, with lyrics too graphic to quote here. Yet, professing Christian Lecrae seemed to have been more than okay with that - at least enough, one can only assume, to have sought him out specifically in an effort to work with him on one of a few song choices: "I had just been a fan of his work, then I come to find out that he was a mutual fan of my work. I sent him a couple of records...and 'Blessings' was the one that stuck..." (link), he said. At that, a partnership was birthed, and Lecrae's Blessings was now a team-work effort with a very secular, and arguably anti-Christ, artist. 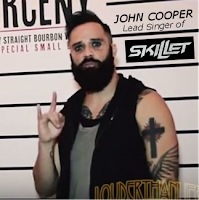 Another band who appears to have "sold-out” may include the compromised hard rock band Skillet, who found a place in the film with its Stars, a song that fits nicely with the film's Universalist feel. Like Lecrae, lead singer John Cooper's focus is not based solely on the gospel. He too believes that “God communicates through art” (link). This concept is not found anywhere in Scripture, but surely lends itself to the invitation of other spirits. Cooper's own words gives us a hint as to whether or not his feet are planted firmly in the faith: “Everywhere we play, I talk about my faith. I leave the ‘Christian’ off because I don’t want to alienate” (link). The Shack also promotes their film with its inclusion of Aloe Blacc (working with Kelly Clarkson), best known for his hit singles, I need a dollar and The Man, which topped secular charts in the UK. Blaac's faith may as well have little or nothing to do with Christianity in particular. “A project like this - a film like this - continues to affirm my faith and my belief that we're just a small part of what makes this world beautiful”, he said. “There's definitely a higher power.” (link). While it is good to know that there is something "greater" than us, certainly a supposed "Christian" film shouldn't be promoting their film with artists that aren't even convinced that the faith is about Jesus Christ alone. Francesca Battistelli also came on board having written a song specifically for the project: “This film has really changed the way I visualize the fact that God is always with me, and the fact that He loves me so much. ", she says (link). NeedtoBreathe also found its way on the soundtrack with their hit song Hard Love - with a little help from three-time Dove Award winner Lauren Daigle - who won Artist of the year in 2016 (link). It is interesting that she has also taken a role in helping promote the film with both her statements and musical talents. Perhaps her personal view of God had something to do with it. “I think one of the favorite things about this movie and the impact it had on me was seeing all the representations of God.”, she said of the film. In The Shack, God is represented as three separate individuals, literally humans, two of whom are female. “I love the fact that He was portrayed as a female...I guess I always think of God as a man”, she said (link). Why should any of this matter to professing believers? Because secular artists are beginning to be accepted into Christian music under the umbrella of unity through Universalism. Likewise, Christian artists are also leaning in the same direction, and being placed into leadership roles through their music (and their comments) through their work done on films such as The Shack. Their involvement in the promotion and approval of such films - regardless on the pressure that may be placed on them by their label - sheds some light on their personal theology. Since these artists are presenting supposed truths about the Christian faith, it is fitting to fully investigate their claims. A special thank you to Tony Palacio and Chad Davidson for their contribution to this article.